My teaching interests include Constitutional Law; Comparative Law; Constitution-making; Law and Development; Administrative Law; Asian Legal Systems; Law and Religion; and Law and Society. I have taught a range of workshops overseas, including on Judicial Independence; Principles and Processes of Constitution-making; The Role of Courts in Democratisation; Constitutional Courts in Federal Systems; Federalism and Minority Rights; Emergency Powers. This course will provide students with an introduction to the contemporary Indonesian legal system. Indonesia is the world’s third largest democracy and the world’s largest Muslim-majority country. It has a growing economy and an expanding middle class. Since 1998 and the end of authoritarian rule, the country has experienced significant legal and constitutional reform. These reforms have been accompanied by a growing legal profession and changes in legal education. There has also been a major expansion and specialisation in the judicial system, with a range of new courts established to address particular disputes, from the Constitutional Court to the Commercial Court and Tax Court. Indonesia is a civil law system, though it is also influenced by aspects of Islamic law and indigenous traditions. The study of Indonesia’s legal system opens up important debates for scholarly inquiry about legal pluralism; legal change; the role of courts in democratisation transition and consolidation; and the viability of specialised courts. This is a research-intensive subject. Students are encouraged to have completed or be undertaking Law in Global Context. 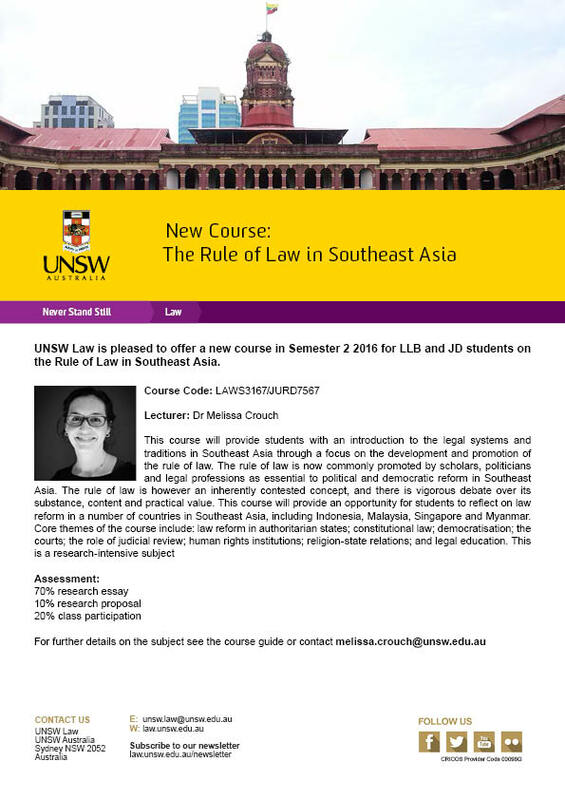 This course provides students with an introduction to legal traditions of Southeast Asia through a critical focus on development and the rule of law. The rule of law is now commonly promoted by scholars, politicians and legal professions as essential to political and democratic reform in regions around the world, including in Southeast Asia. The rule of law is however an inherently contested concept, and there is vigorous debate over its substance, content and practical value. 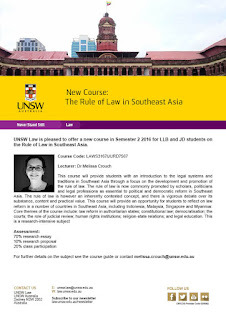 This course will provide an opportunity for students to reflect on law reform in Southeast Asia, including Indonesia, Malaysia and Myanmar. Core themes of the course include: law reform in authoritarian states; constitutional law; democratisation; the courts; the role of judicial review; human rights institutions; religion-state relations; and legal education. For the course guide see here. 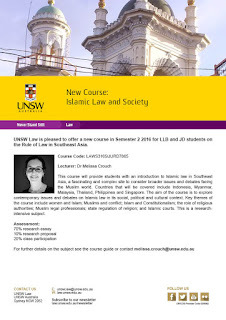 This course provides students with an introduction to Islamic law and society in Southeast Asia. The region of Southeast Asia provides a fascinating and complex site to consider many of the broader issues and debates facing the Muslim world. Countries that will be covered include Indonesia, Malaysia, Thailand, Philippines, Singapore and Myanmar. The aim of the course is to explore contemporary issues and debates on Islamic law in its social, political and cultural context. Key themes of the course include Islam and constitutionalism; the role of religious authorities; Muslim legal professionals; women and Islam; Muslims and conflict; state regulation of religion; and Islamic courts. This course would appeal to students who are interested in deepening their understanding of Islamic law and exploring debates concerning secularism; the significance of religion to legal traditions in Asia, and the interaction between Islam and democracy in the region. For the course guide see here. Rule of Law in Southeast Asia. I have taught in the JD, LLB and Masters programs at several law faculties, including Monash University, the University of Sydney, the University of Melbourne and the National University of Singapore. I have been invited to give guest lectures to students at universities in Australia and overseas for subjects such as Islam and the State in Southeast Asia; the Indonesian Legal System; the Indonesian Constitutional Court; the Rule of Law in Asia; Law and Foreign Investment in Asia; and Law Reform in Myanmar.